A report says that Sony has used a better quality IPS display panel on the Sony Xperia Z1 mini (Xperia Z1f), with better contrast and quality than on the bigger brother Xperia Z1. The Xperia Z1f (the international version will be called Xperia Z1s) has a smaller 4.3-inch IPS display with 720p resolution, smaller 2300 mAh battery, but still the users says that both the screen and battery life is better on the Xperia Z1 mini. 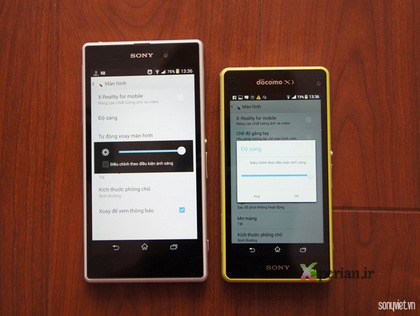 Some photos comparing the Sony Xperia Z1f / Xperia Z1s with the bigger brother Xperia Z1 has showed up in Vietnam. The photos is comparing colors and viewing angles between the two displays. To me personally it’s hard to tell though if the mini really has a better display, but judge for yourself below. A rumor says that we will see the Sony Xperia Z1s officially announced on January 3rd, so it will be interesting to see if this is true.